If Australia were beaten convincingly in Cardiff, England has been mutilated at Lords. They were dead lucky to crack 100 on a pudding of a cricket pitch where Australia had scored 820. If Stuart Broad didn’t counter-attack and top score with 25, England were destined for a sub-100 annihilation. So heavy was the 405 run defeat, at least four English players face the chopping block for the next Test. It’s an intergalactic reversal of fortunes that will leave betting agency strategists ripping shreds of hair from balding scalps. Adam Lyth appears to have already done that. He was worked over, again, by Mitchell Starc in the second innings and is under to pressure to stay in the team. England’s used about 12 openers since their tour of Australia in 2013-14 and it seems Cook might have to open the batting by himself if the current trend continues. The top order is failing. England have been 3 for 70 or worse in 11 of their last 13 Tests. Garry Ballance is all at sea against genuine pace and Ian Bell’s Lyth also hangs in the Ballance. And so it did. Jimmy Anderson went without a wicket at Lords. A lifeless feather bed suited to scoring thousands when the sun was shining was equally unhelpful to England’s own formidable pace attack. But Australia has something England do not; genuine express pace through the air and with that, sometimes you don’t need a favourable pitch. Although Anderson and Broad are sharp, Johnson and Starc are Orient (express). Johnson bowled well and without luck in Cardiff but you could clearly see England’s batsmen were wary, if not fearful. In the fourth innings at Lords England’s fear was exemplified in their swatting evasion and eventually, for Cook, Ali and Buttler, their dismissals. Australia were hostile. Johnson extracted bounce and carry and struck Joe Root in the face and prized out Moeen Ali, who had no choice but to protect his life when one reared up into his bearded boat. He was caught at bat pad. All of Australia’s bowlers were in on the act suggesting that they hunted as a pack and sustained an unrelenting pressure that asphyxiated England to the point of hapless defeat. The teams take a 10 day break before the third Test at Edgbaston. Birmingham is a completely different prospect to the private school-boy filled Lords. It’s a rowdy, fancy dress, beer swilling type atmosphere and the Barmy Army – banned at Lords – will be back on-board. It is Warwickshire-man Ian Bell’s home ground and this might be the fact that saves his Test career. He’s a brilliant player who is deeply out of sorts and if Ballance goes, he may even find that selectors toss him a career defining challenge; bat at three. At six wickets down last night the ECB were already tweeting about possible replacements: they announced a county century by Johnny Bairstow with a thinly veiled implication. Ballance and Lyth are also under the pump and some might be surpirsed to know that Marcus Trescothic is still getting around for Somerset. Could he replace Lyth? 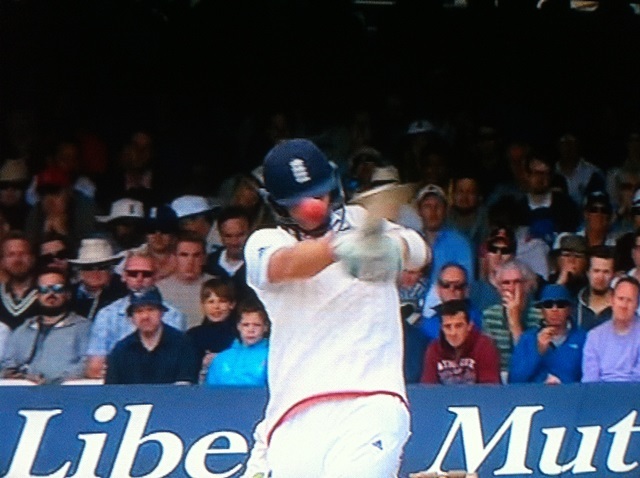 Steve Finn and Mark Foottit linger for Mark Wood’s place. Trevor Bayliss, England’s new coach, is known to be conservative though and he may support the use of the same squad next week. In a county match at Edgbaston on the weekend former New Zealand off-spinner Jeetan Patel took 5 wickets for Wawrickshire suggesting that Birmingham might be a spinner. Does England have one? Adil Rashid perhaps. Shane Watson won’t get near the Australian all-rounder position after Mitch Marsh’s solid performance at Lords. He could get back in if Chris Rogers fails to recover from vertigo/illness and Australia elect to open with Watson instead of Shaun Marsh, the other option. Watson got into Australia’s Test side at Edgbaston as an opener in 2009 when Phil Hughes was dropped after two Tests. It would be a strange quirk if Watson made it back into the side there next week. The series is alive and England can be expected to retaliate. Reports indicate Australia will make changes to its XI for the fifth and final Test. This means that in every one of its last 13 Test matches, Australia has changed its line up and batting order. We’ve lost 8 of those, with one to play. For tonight’s Test at the Oval I can understand Mitchell Starc replacing Jackson Bird, but James Faulkner replacing Usman Khawaja? Australia has significant problems with its batting, so what do we do? Drop a batsmen and bring in an all-rounder who averages 30 with the bat in First Class cricket. The selection mismanagement and total lack of continuity and direction in this Australian set up is appalling. This isn’t to say that James Faulkner isn’t a reasonable candidate for selection, but the circumstances demand we pick our strongest possible batting line up. There is no evidence to suggest we’ve done that here. In early 2013 Ed Cowan was one of Australia’s better performers in a barren series in India, albeit as an opener. He was moved to number 3 for the First Ashes Test, but failed, and was dropped. Usman Khawaja replaced him at Lords. He lasted three Test Matches. One 50 in 6 innings is hardly a suitable return, but the fact Khawaja (again) was picked meant the selectors believed he had the ability to become a Test standard number 3. You may fail to convert it, but you don’t lose ability 3 weeks. This is the second time Khawaja has been dropped from the Test side. He’s played 9 Tests and averages 25. Surely he’ll be consigned to some lengthy graft at Shield and County level to prove he is worthy once again? Maybe not though, he could be back in the side sooner than that. The establishment may handle Khawaja like they did Phil Hughes – who was dropped about 18months ago (for the second time), and consigned to less than half a season in Shield cricket, before being brought back to play at home versus Sri Lanka, and away in India. Based on the mean, Hughes didn’t have a shocker in Inida, and retained his place for the First Ashes Test. He scored an 80odd not-out in the first innings at number 6, a less recognised cameo to the famous 98 by Ashton Agar. Hughes failed in the second innings of that Test, and was then promoted up the order to number 3 for the 2nd Test after Ed Cowan was dropped. In the Lords massacre, Hughes didn’t get a run and was dropped for the Third Test, replaced by David Warner. Shane Watson is reportedly now the man to bat at 3, after batting at 4 and 5 in India, opening in the first 2 and a half Tests of this series, then batting at 6 in the last 3 innings. Based on the continual shuffle, Khawaja might find himself opening the batting in the return series in Australia. Or he could be at number 6, or 4. Maybe even wicket keeper? Has he got a good set of gloves in his kit bag? Perhaps he should get some. England’s Joe Root performed brilliantly on Day Three at Lords, dispelling the perception he was the weak link in the host’s top order. Root routed Australia and batted right through the day amassing an unbeaten 178 off 334 balls including 18 fours and 2 sixes. The Root epic was exactly the type of innings Australia’s top order have shown to be utterly incapable of replicating and it also established, with abundant force, just how pathetically inadequate Australia’s first innings batting display was. Across two innings Root himself now leads Australia by 56 runs, and if Captain Cook decides to carry on the punishment for Australia’s bowlers it’s possible he alone could establish a lead Australia couldn’t successfully chase. England’s Captain will declare at some point during the first session on Day Four, perhaps providing Root enough time to nail a double tonne and to push the lead beyond 600. Some may have questioned why the declaration hasn’t come already. With plenty of time and a good weather forecast, why wouldn’t England take this opportunity to belt Australia into total submission, by setting an impossibly gargantuan lead and physically and psychologically brutalising Australia’s only strong point, its bowlers. With another three Tests to play in this series – and another 5 in Australia soon after – this is good captaincy from Cook. In an intensely psychological game, nobody should underestimate the lasting impact this approach may have on England’s opposition. I missed most of Day Three as I was otherwise engaged. I did manage to see a few overs in a bar late on in the second session when I joined a heap of the lads for a pint. The English amongst our posse were quick to remind us of the tortuous pain they’d endured from a many a big mouthed Aussie, when Australia battered England for a 15 year period. We weren’t getting any sympathy from them last night, as they enjoyed the spectacle and cheered on Joe Root and co.
* This is a reference to a quote by Donald G Bradman who made this statement during the infamous Bodyline series – the 1932-33 Ashes Series in Australia. Paul Kelly wrote a song about Bradman in which this statement is quoted.